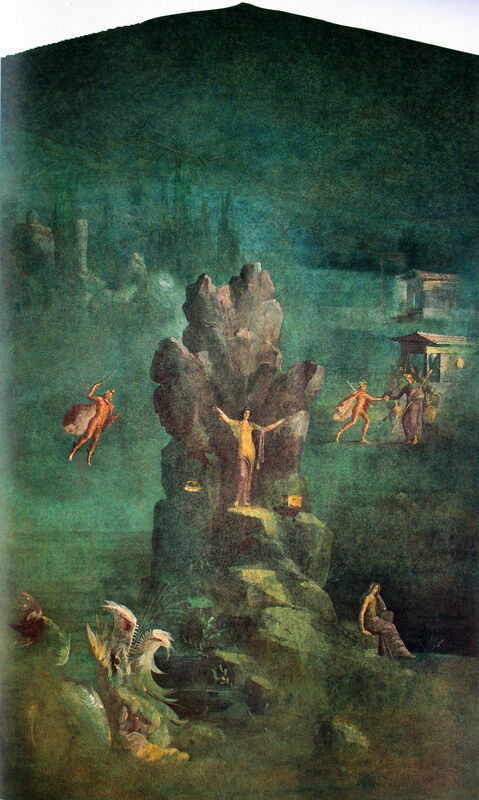 As he nears the end of Book 4 of Metamorphoses, Ovid has completed his account of the myths of the Theban cycle, with the transformation of Cadmus and Harmonia into snakes. His switch to start telling stories about Perseus is abrupt, referring in passing to Perseus’ mother, Danae, and his well-known conception by Jupiter in a ‘shower of gold’. Ovid makes this even more stark by launching into his stories of Perseus in medias res (in the middle of the action). Instead of giving us the background of why Perseus set off to behead Medusa, or telling us that part of the story first, we find Perseus flying over North Africa with Medusa’s severed head tucked safely in his rucsac (kibisis). As Perseus flies over the desert sands of Libya, the blood still drips from Medusa’s head and falls onto that sand, where it transforms into snakes. With dusk approaching, he decides to set down in the lands of Atlas, the giant. Perseus introduces himself to Atlas, including his divine paternity, and asks for rest and lodging for the night. of a high peak; — his bones are changed to rocks. unnumbered stars, on him command to rest. weeds of the sea, produced beneath the waves. from plants wide-scattered on the salt expanse. becomes a stone when taken from the sea. Perseus makes offerings to the gods, and prepares for his wedding with his newly-won bride. The myths of Perseus, particularly those of Perseus and Andromeda, have been very extensively depicted in paintings. I have previously surveyed many of them, and given an account of the particularly detailed series by Edward Burne-Jones. Very few have shown Atlas turned into a mountain. 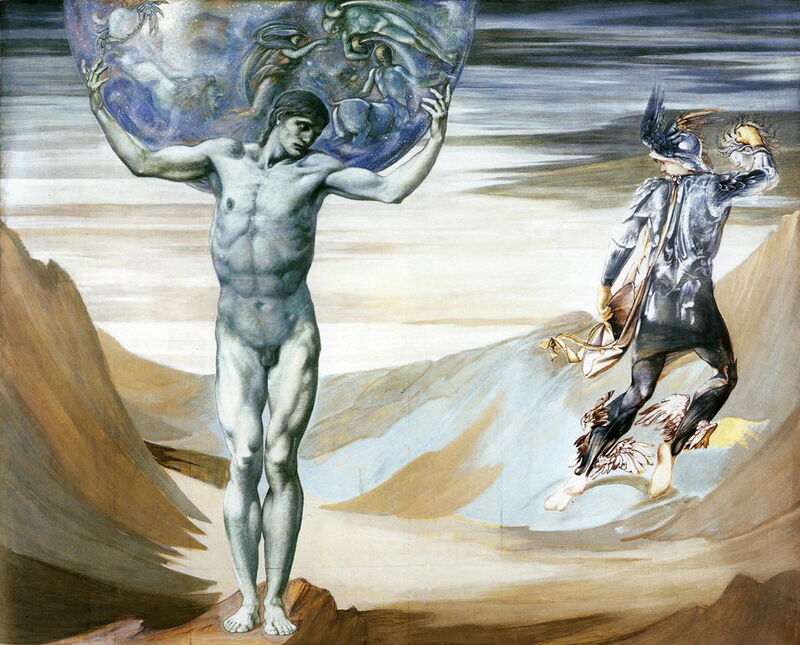 Edward Burne-Jones (1833–1898), The Perseus Series: Atlas Turned to Stone (1878), bodycolour, 152.5 × 190 cm, Southampton City Art Gallery, Southampton, England. Wikimedia Commons. 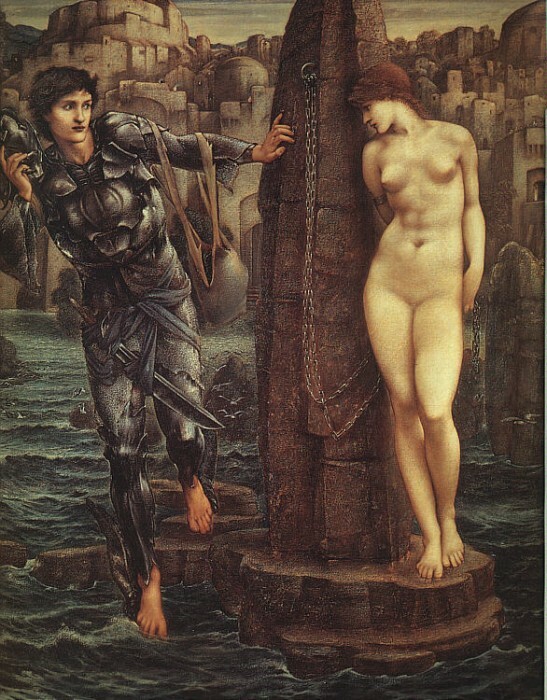 The seventh in Edward Burne-Jones’ series of paintings about Perseus, his Atlas Turned to Stone (1878) shows the aftermath of Atlas’ failure to offer hospitality: he has been turned to stone by the residual power of Medusa’s face, and now stands bearing the cosmos on his shoulders as Perseus flies off to Ethiopia. It is a modern misunderstanding that Atlas, standing in the barren mountains named after him, bears the world: he bears the heavens, shown here using representations of the named constellations. In contrast, the rescue of Andromeda is far more popular, particularly as she has been almost universally interpreted as chained naked to the rock. Unknown, Perseus Freeing Andromeda (c 50-75 CE), height 122 cm, Casa dei Dioscuri (VI, 9, 6), Pompeii, moved to Museo Archeologico Nazionale di Napoli, Naples. By WolfgangRieger, via Wikimedia Commons. This Roman wall painting from the ruins of Pompeii, dated to about 50-75 CE, adopts the approach typical of many later artists, showing a close-up of the couple. Andromeda is still chained to the rock by her left wrist, and is partially clad, nakedness being reserved for the hero and half-god Perseus. He has Medusa’s head tucked behind him, the face shown for ease of recognition, wears his winged sandals, and carries a straight sword in his left hand. There is no sign of any sea monster, though. Titian (Tiziano Vecelli) (1490–1576), Perseus and Andromeda (1553-9), oil on canvas, 179 × 197 cm, The Wallace Collection, London. Wikimedia Commons. 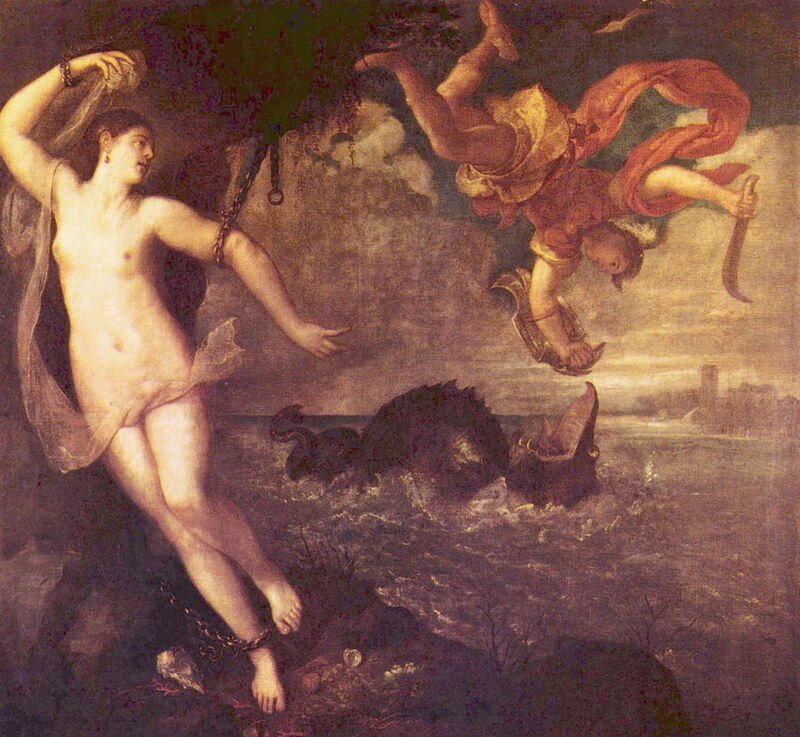 Titian’s Perseus and Andromeda (1553-59) improves on that by showing the height of the action, remaining largely faithful to Ovid’s details. 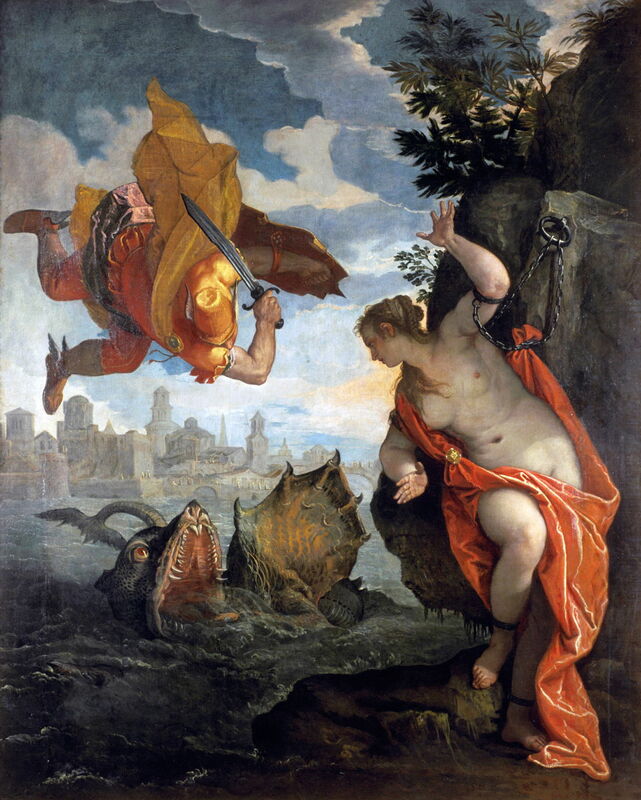 All three actors are present, with Andromeda still shackled and Perseus attacking Cetus, the sea monster, from the air using a sword with a curved blade. Paolo Veronese’s Perseus Rescuing Andromeda followed soon afterwards, in 1576-78. 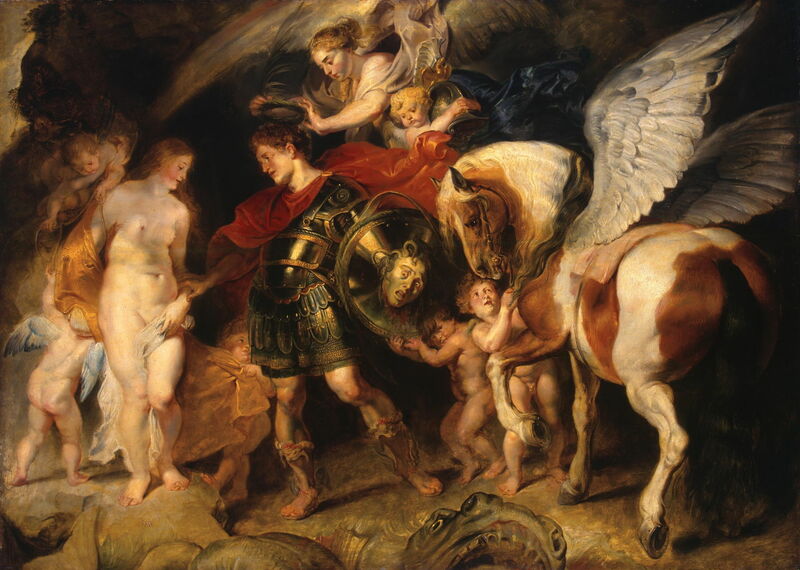 His composition is similar to Titian’s, and equally faithful to the text, but his additional attention to the details of Perseus and Cetus bring this to life, making it one of the finest depictions of this scene. One snag with these is that none contains any clues as to the eventual resolution of the story. Three centuries later, Edward Burne-Jones used a long series of watercolour studies and finished oil paintings to cover the whole story. Edward Burne-Jones (1833–1898), The Perseus Series: The Rock of Doom (c 1885-8), oil on canvas, 155 x 130 cm, Staatsgalerie Stuttgart, Stuttgart. Wikimedia Commons. The eighth of those paintings, The Rock of Doom (1884-5), shows Perseus arriving, and just about to start his negotiations to secure Andromeda’s hand in marriage. Medusa’s head is safely stowed in the kibisis on his left arm. Andromeda is naked, looking coy and afraid with her face downcast. Edward Burne-Jones (1833–1898), The Perseus Series: The Doom Fulfilled (1888), oil on canvas, 155 × 140.5 cm, Staatsgalerie Stuttgart, Stuttgart. Wikimedia Commons. 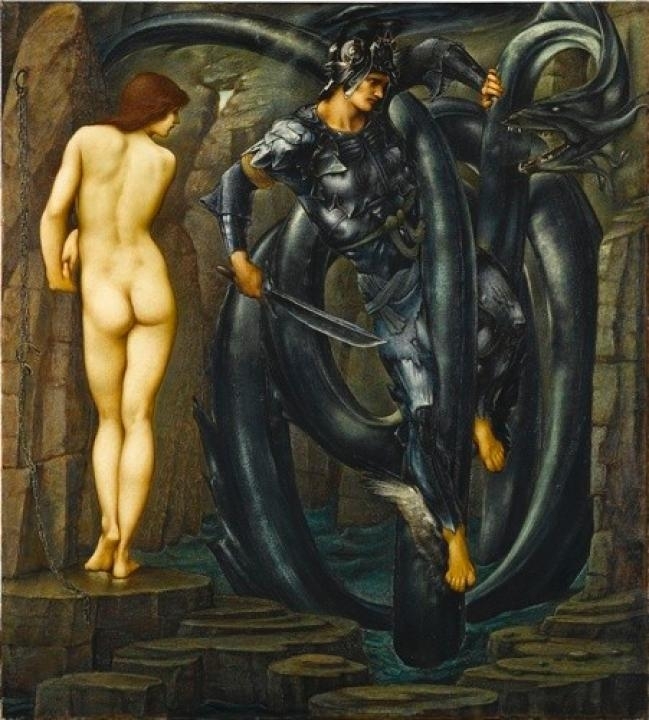 In the ninth painting, The Doom Fulfilled (1888), Perseus is swathed in Cetus’ coils (with their almost calligraphic form), brandishing his sword and ready to slaughter the monster and bring its terror to an end. Peter Paul Rubens (1577–1640), Perseus and Andromeda (c 1622), oil on canvas, 99.5 x 139 cm, Hermitage Museum, Saint Petersburg, Russia. Wikimedia Commons. Rubens’ Perseus and Andromeda (c 1622) shows a later moment in which the action is just past, but the outcome more obvious. Andromeda is at the left, now unchained but still almost naked. 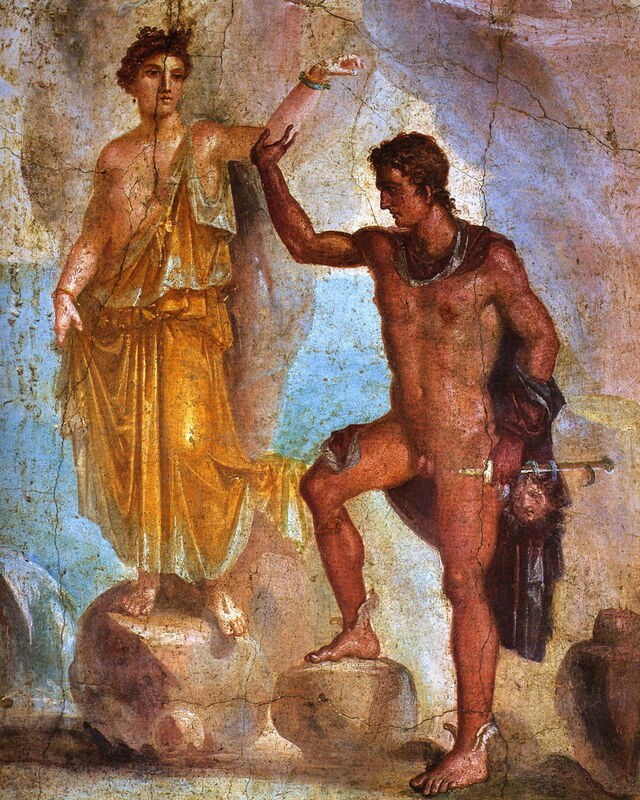 Perseus is in the process of claiming her hand as his reward, for which he is being crowned with laurels, as the victor. He wears his winged sandals, and holds the polished shield which still reflects Medusa’s face and snake hair. One of several putti (essential for the forthcoming marriage) holds Hades’ helmet of invisibility, and much of the right of the painting is taken up by Pegasus, which derive from a different version of the myth. At the lower edge is the dead Cetus, its fearsome mouth wide open. Two remarkable paintings have told the story using multiplex narrative. Unknown, Perseus and Andromeda (soon after 11 BCE), from Boscotrecase, Italy, moved to The Metropolitan Museum of Art, New York, NY. By Yann Forget, via Wikimedia Commons. This Roman painting from Boscotrecase, near the coast at Pompeii, dates from soon after 11 BCE, and puts the story into a larger landscape, much in the way that later landscape painters such as Poussin were to do. Andromeda is shown in the centre, on a small pedestal cut into the rock. Below it and to the left is the gaping mouth of Cetus, as Perseus flies down from the left to rescue Andromeda, kill the sea-monster, and later marry Andromeda in reward, as shown in the upper right. Piero di Cosimo (1462–1521), Andromeda freed by Perseus (c 1510-15), oil on panel, 70 x 123 cm, Galleria degli Uffizi, Florence. Wikimedia Commons. 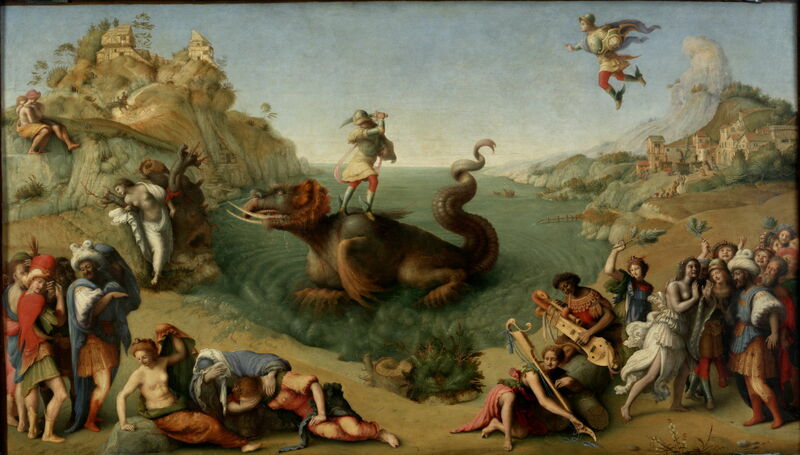 Piero di Cosimo shows even more events within his large Andromeda Freed by Perseus (c 1510-15). Centred on the great bulk of Cetus, Perseus stands on its back and is about to hack at its neck with his curved sword. At the upper right, Perseus is shown a few moments earlier, as he was flying past in his winged sandals. To the left of Cetus, Andromeda is still secured to the rock by red fabric bindings (not chains), and is bare only to her waist. In the foreground in front of Cetus are Andromeda’s parents stricken in grief. Near them is a group of courtiers with ornate head-dress. But in the right foreground the wedding party is already in full swing, complete with musicians and dancers. Ovid’s telling of this story is one of his most carefully-structured narratives; it is rich in action, with all the ingredients necessary for the many superb narrative paintings which have been made. As a result, it’s an excellent read, with excellent art. Posted in General, Language, Life, Painting and tagged Andromeda, Burne-Jones, di Cosimo, Metamorphoses, myth, narrative, Ovid, painting, Perseus, Rubens, Titian, Veronese. Bookmark the permalink.